When was the last time a co-worker told you, “you matter?” Would that have a positive impact on your day, week, or month? Thoughtful leaders are not just concerned with getting the job done, they are also concerned with the qualitative experiences that lead to exceptional performance – experiences that enhance engagement, recognition, and inclusion for all employees. Creating a sense of belonging at work is good business. One way to enhance belonging is to participate in the You Matter Marathon – No Running Required. The You Matter Marathon is a global initiative that creates positive connections between individuals and within communities by inviting people to share business-sized cards with only the words, You Matter, on them. Last year almost half-a-million cards were shared by people in 59 countries. And more impressive than those numbers was the impact of even one card share on someone’s life. Here is a 3-minute video of the You Matter Marathon in action. If your organization is looking for a cost-effective and engaging way to build genuine connection and engagement, please consider signing-up for the You Matter Marathon. 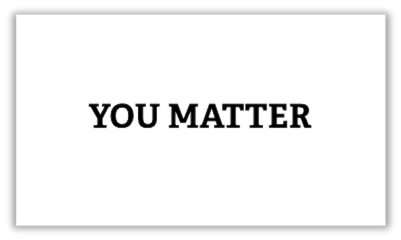 The first 3,000 people to sign-up will receive 30 You Matter cards for free. Cheryl Rice, MS, PCC, is an executive coach, speaker, and author of the memoir, Where Have I Been All My Life? Cheryl’s passion is helping women be leaders in their own lives. Thank you for your comment. Hope you can participate.